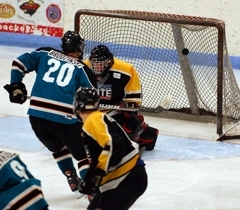 The Upper Midwest High School Elite Hockey League can be intimidating even for battle-hardened seniors. 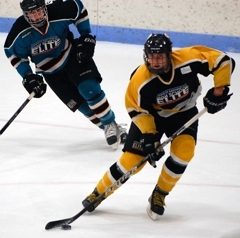 Imagine how it has been for Jake Guentzel, a 5-foot-6, 135-pound sophomore enrolled at Hill-Murray. 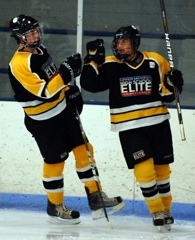 That hard work has been paying off – especially recently as Guentzel contributed two goals during league-leading Team Northwest’s 6-2 victory over Team Southwest on Tuesday, Oct. 19, at New Hope Ice Arena in New Hope. “We had a good game,” Guentzel said. “Second period was our best. We came out good and everyone was working, we were making plays, it was a great game. In 13 games since being called up from the Elite Development League, Guentzel has registered 10 points – 5 goals and 5 assists. Not too shabby for a sophomore. 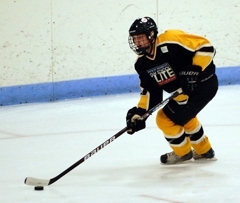 Guentzel is one of three sophomores in the Team Northwest lineup, joining T.J. Roo of Totino-Grace and Grant Besse of Benilde-St. Margaret’s. 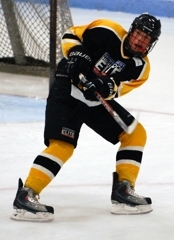 Guentzel has been playing on a line with Benilde-St. Margaret’s junior Christian Horn and Wayzata senior – and future University of Minnesota-Duluth Bulldog – Tony Cameranesi, the Elite League leader in points with 31 points (15 goals, 16 assists). With or without help, hockey seems to be in Guentzel’s future. Few players can match his bloodlines. Guentzel’s oldest brother, Ryan, is a senior at the University of Notre Dame. 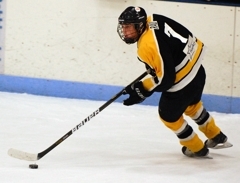 Another brother, Gabe, is a junior and an assistant captain for Colorado College. 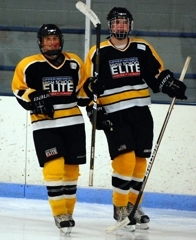 Both brothers spent time in the USHL with the Sioux City Stampede. Their father, Mike Guentzel, is in his first year as an assistant coach for the University of Nebraska-Omaha team that swept the University of Minnesota this past weekend (Oct. 15-16). The Mavericks are playing their first year in the WCHA during the 2010-2011 season. “I’m kind of thinking about following Gabe out to Colorado, but I’m just playing it out and enjoying high school,” Jake Guentzel said about his future. The Benilde-St. Margaret’s sophomore ignited a four-goal second-period flurry with what proved to be the winning goal on a one-timer from the right face-off circle and scored again less than three minutes later. He now has 20 points in 19 Elite League games to tie for 10th on the league scoring list. Franke, a junior from Elk River, stopped 47 of 49 shots, including 21 in the third period as Team Southwest tried to climb back into the game. 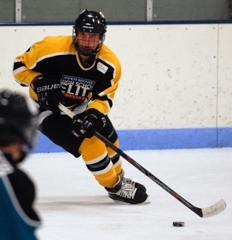 A senior defenseman from Blake, Bullock registered an assist and was superb all game at both clearing the puck from the defensive zone and generating offense from the blueline. “Waiting by the phone” no longer works as a way to describe someone anxiously anticipating a call. So let’s just say Grant Opperman has been keeping his cell fully charged and within fingertips’ reach for the past several weeks. 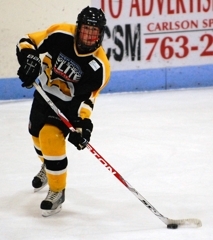 Tomorrow finally came on Tuesday, Oct. 19, for Opperman, a junior forward from Breck who got the call to suit up for Team Northwest of the Upper Midwest High School Elite Hockey League. 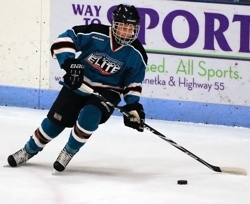 Opperman, who ranks fifth in the Minnesota Elite Prep Development League with 23 points and second in goals with 15, had a goal and an assist for league-leading Team Northwest in its 6-2 triumph over Team Southwest at New Hope Ice Arena in New Hope. 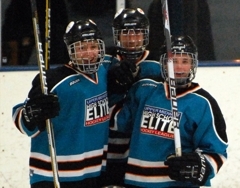 Opperman might be new to the Elite League, but he was no stranger to many of his teammates. 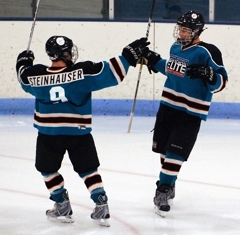 He played youth hockey in Wayzata, and, as a Bantam A, Opperman joined Grant Besse and Mario Lucia on a dominant line on a state championships team. 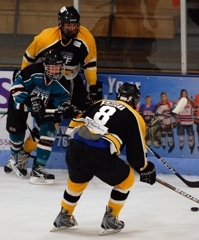 Besse, who plays for Benilide-St. Margaret’s did, indeed, have two goals in the Team Northwest victory. Lucia, a junior at Wayzata, did not play. 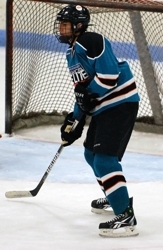 For the past several weeks he has been skating for the U.S. national under-18 team. Last winter, Opperman scored 24 points (eight goals, 16 assists) in 30 games as Breck won its second straight Class A title. 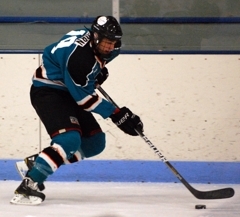 That team graduated 12 seniors, and junior forward Wes Iverson is the only Mustangs player that made an Elite League roster. Scouts from 15 NHL teams, five Division I colleges and four USHL teams were in attendance at New Hope Ice Arena in New Hope on Tuesday, Oct. 19, for the Elite League matchup between Team Southwest and Team Northwest. 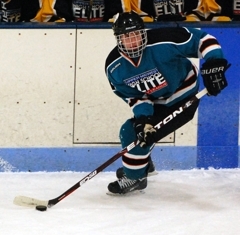 Scouts are asked to put their name and organization on a sign-in sheet at Elite League games. 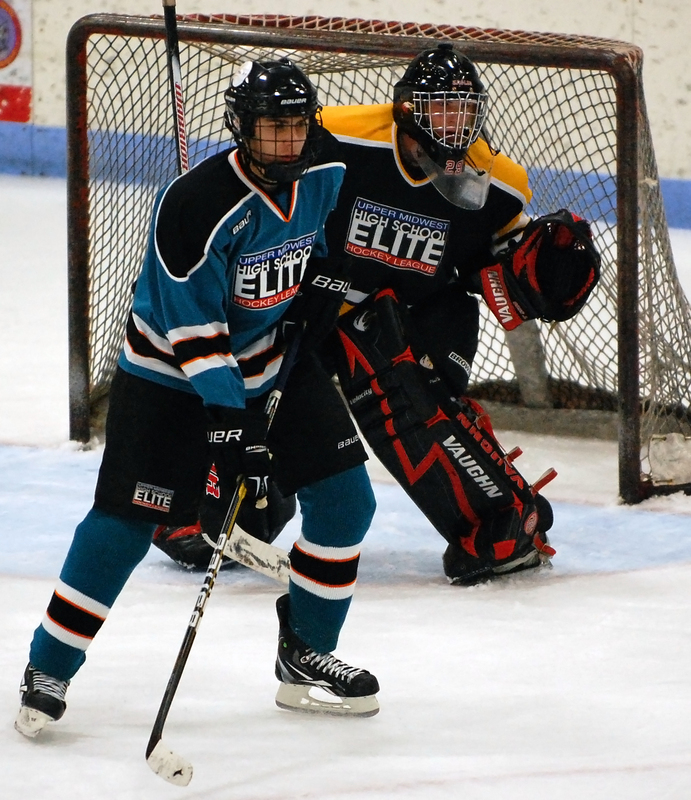 Team Northwest scored four goals in a 3 minute, 25 second span of the second period to rally from a one-goal deficit and cruise past Team Southwest 6-2 on Tuesday, Oct. 19, in an Upper Midwest High School Elite League game at New Hope Ice Arena in New Hope. 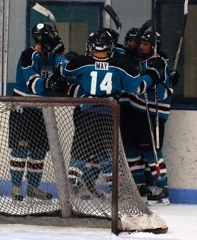 The victory gives first-place Team Northwest 25 points in the Elite League standings with two games to play. Team North and Team Wisconsin each have 21 points and are tied for second place with three league games left. Grant Besse of Benilde-St. Margaret’s scored twice, and Jake Guentzel of Hill-Murray and Grant Opperman of two-time defending state Class A champion Breck also added goals during Team Northwest’s second-period flurry that turned a 1-0 deficit into a 4-1 lead. Besse started the binge at 8:12 of the second period and Opperman, making his Elite League debut, capped the outburst at 11:37. Guentzel scored again in the second period with 0.3 seconds left on the clock to give Team Northwest (12-6-1) a 5-1 lead. Eden Prairie’s Kyle Rau opened the scoring for Team Southwest (7-8-3) with a breakaway goal early in the second period. Tyler Heinonen of Delano scored in the third period for Team Southwest. Team Northwest’s Jonny Brodzinski of Blaine also scored in the third period. 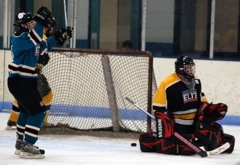 Team Northwest’s Anders Franke of Elk River made 47 saves to earn the victory. 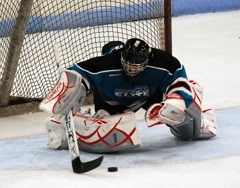 Team Southwest’s Andrew Ford of Eden Prairie made 37 saves.